A Cold War spy thriller set in 1961 about two brothers, former CIA agents, reunited in Moscow twelve years after the elder defected to Russia as a spy. 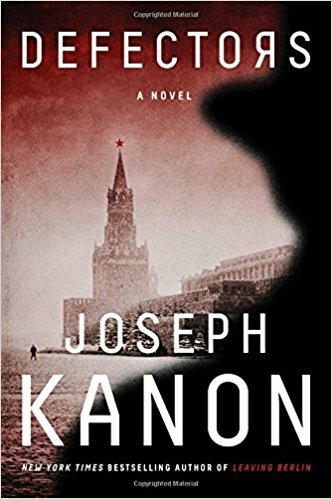 [Kanon] "is a master of the genre, and here delivers a book that will appeal to fans of The Americans and Bridge of Spies ... Frank’s plan to escape the Soviet Union is immensely complicated, but its unfolding is enhanced by Kanon’s graceful writing ... as readable and suspenseful as the fine espionage novels of Eric Ambler, Graham Greene, Charles McCarry, Robert Littell, Alan Furst and John Le Carré — and its roller-coaster plot will keep you guessing until the final page. Each time I’ve finished one of Kanon’s books, I’ve asked myself why I haven’t read all of them. There are now eight. As soon as I was done with Defectors, I ordered all the rest from my local bookshop ... Kanon’s is a finely observed portrait of a bitchy, brittle, incestuous world ... If I have any complaints about Defectors, it’s that its depiction of the Soviet Union of 1961 doesn’t seem nearly grim enough. I was there 28 years later, and the place was a dismal dump where only the American dollar had any value. But this is a small complaint, particularly since all the substantial details of the novel’s setting are accurate. This setup makes for intriguing stuff, especially given Joseph Kanon’s deft hand at sketching the old world of spies and their craft. But the book’s narrative doesn’t really take off until Frank throws a twist into the plot. It seems that he, the spy who has always presented himself as the true believer in the communist cause, now wants to sneak back home, and he expects Simon to play an indispensable role in this great escape. Kanon spins out this story with just the right amount of expert detail and vivid twists to make it convincing and entertaining in the tradition of John le Carre and Charles McCarry. What did you think of Defectors?